The Via Tarot: The Path of Life began as a visionary dream, and through a series of scryings, images for the Major trumps were received from entities identified by the artist as the Daughters of Light and the Daughters of the Daughters of Light. The images channeled to Susan Jameson were at first seen as small bubbles of light, which would slowly grow over time as the full image of a given card was revealed. Included at the top of the minor arcana cards is a circular inset contaning additional imagery which was intended to be included in Aleister Crowley's Thoth deck as he initially designed it, but were inexplicably left out by the painter despite his intentions. Thus, the Via Tarot can be considered a tribute to Crowley. 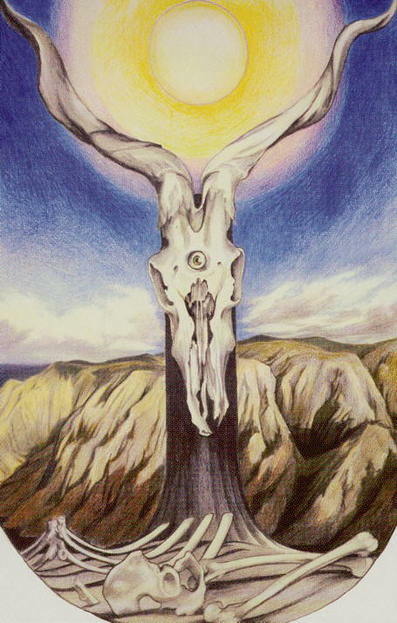 The Devil card shows an elongated, sun-bleached goat skull attached to a column rising from the ground with bones scattered about in the foreground. The skull has a single cyclops eye in addition to its' two empty sockets. The twisting horns rise up to the upper corners of the picture and within this triangular area is a blazing sun. The effect here reflects the tremendous will to life that we possess, even in the most challenging or frightening circumstances.